The preliminary stage of the top-down summary on the Matter-Being Paradigm is presented in the posting: QA: What is Quantum Meditation (Paradigm Summary). The bottom-up Summary of the Paradigm, in preliminary stages, are in this posting: QA: What is Quantum Logic (Paradigm Summary) and the posting: QA: What is Quantum Computer (Paradigm Summary). QA: What is the Universe Accelerating? This diagram contains the following summaries (see Book and the discussions below for details). 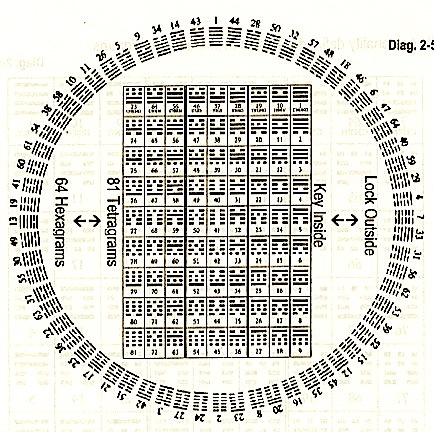 9 = 3–3–3, 3 sets of numbers, 3 Octagons, 3 Circles —> Holon of Everything, 1 produce 2, 2 produce 3, 3 produce the Holon of Everything. 3 generates 精-氣-神, 3+3 generates 身-心-靈, 3+3+3 generates 靈 -魂-魄. 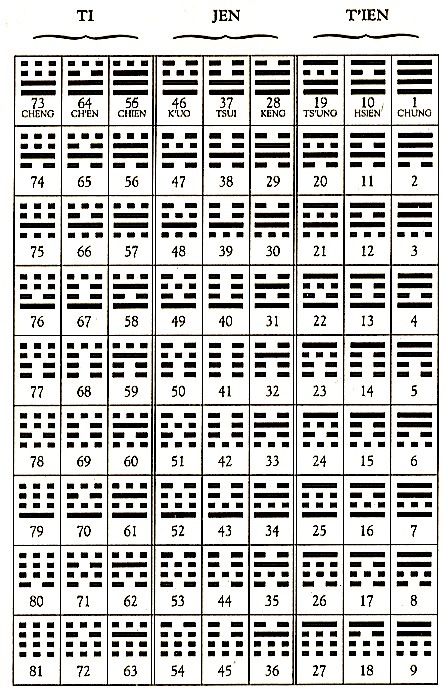 Ten Logic Potentials: yin, yang, bigram, trigram, tetragram, pentagram, hexagram, pre-heaven octagon, post-heaven octagon, thought octagon with neutral lines. 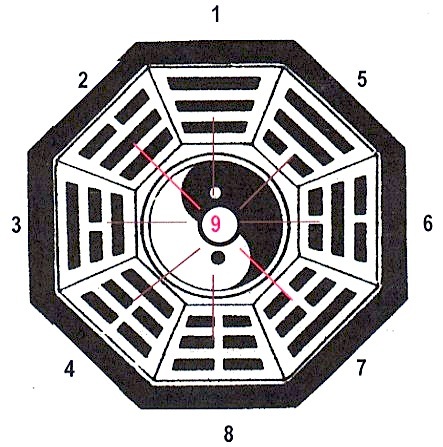 Aether: the mandala inside the inner octagon, which is the Holon of 3-circles—yin-yang lines—9. 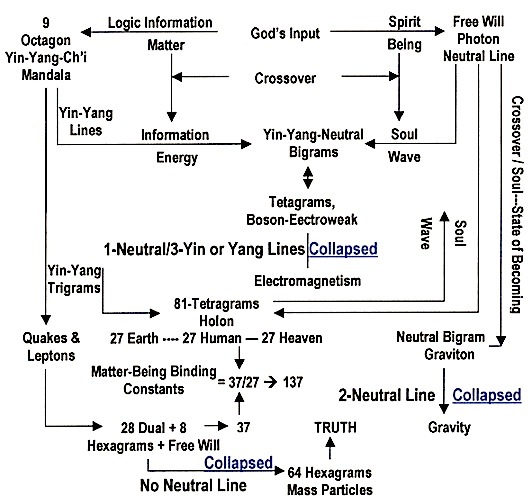 Space is generated by collapsing three sets of yin-yang wave functions generated by the yin-trigram logic of neutrino and the yang-trigram logic of electrons. The boundary in collapsing these three sets of wave forms a physical space. One yin-yang pair of wave function is shown in the inner diagram. The Logic components of quarks and leptons, namely their Logic-Information potentials (see Book for notations and explanation). The bottom diagram denotes the formation of a Graviton with the love of two photon jointing together. 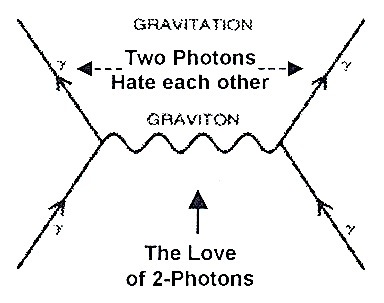 The above diagram depicts the collapsing of a Graviton in the hate of two photons leaving each other to produce gravitation. This explains why gravitation is weak while the gravitons are strong in the lock-key configuration. This explains the love-hate logic in matter; however, the love-hate logic in Being (for examples Humans) is much stronger. Thus, explains the increasing acceleration of the Universe due to today’s human conditions (see PostING, QA: Why Universe Accelerating, and QA: Prophecies-Predictions by a Quantum Observer). The following are depicted in the above diagram. Explains the tremendous difference in Strength between Graviton and Gravity; thus offers a Matter-Being Paradigm explanation for the similar observation on gravity given in Warped Passages: Unraveling the Mysteries of the Universe’s Hidden Dimensions. Bosons are in Soul-Wave Information-Energy states, thus resolved the Boson Coulomb difficulty. To complete the explanation of the above elementary particle diagram, the following three diagrams are needed. 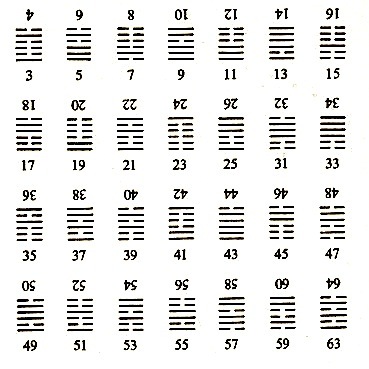 The Yin-Yang line diagrams (bigrams, trigrams, hexagrams) are from the Chinese I-Ching Classic. 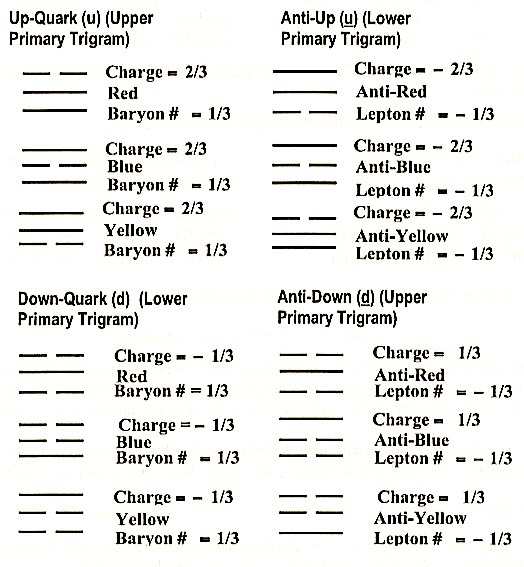 The tetragrams are from the Chinese Classics T’ai Hsuan Ching and Tao Te Ching. This entry was posted on Saturday, April 3rd, 2010 at 4:28 am	and is filed under QA: What is Quantum Logic (Paradigm Summary). You can follow any responses to this entry through the RSS 2.0 feed. Both comments and pings are currently closed.